Why Does This Star Wars T-Shirt Have Fans So Mad? George Lucas is notorious for tinkering with, and changing his Star Wars movies. And most of the time, not for the better. Now, the merchandizing side of things is getting in on the game, and fans don't like it one bit. Some might call Star Wars history sacred. But those people obviously don't work for the company manufacturing Target's novelty T-shirt line. There is a new boys T-shirt hanging on store racks, and it makes a significant change to a key scene early on in the first movie, Star Wars: Episode IV - A New Hope. Let's just say it has caused a major disturbance in The Force. Twitter user @G33KDad first brought the T-Shirt to the Internet's attention late Thursday. The front of this cotton-poly blend T-shirt being sold at Target features an image of Darth Vader flanked by Stormtroopers. He is seen sternly pointing his finger at Luke Skywalker, with a logo that reads, 'I brought the Dark Side...What did you bring?' Innocent enough. Until you realize the photo has been radically changed and manipulated from the scene in the movie. The original scene had 501st Legion stormtrooper officer Daine Jir standing behind Vader, not Stormtroopers. But more significantly, the original image had Princess Leia standing where Luke is now. And the uproar seems to be over the fact that they've changed this aspect to sell it as a 'boys' shirt. 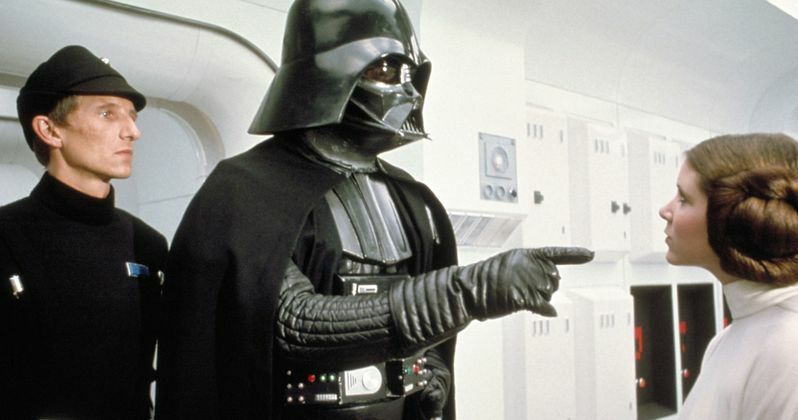 The scene originally had Darth accusing Leia of working for Rebel Spies. Now, this rewriting of history has some fans so angry, they had to write a bunch of blog posts about it. Some are questioning why Princess Leia isn't being allowed to appear on a Boys T-Shirt. Some believe it's because those behind the manufacturing of the T-Shirt don't see Princess Leia as a positive role model for young boys. It seems innocuous at first glance. But that hasn't stopped some, like the geek culture site The Mary Sue from labeling the T-Shirt as 'sexist'. They also call it 'a depressing precedent for the young boys wearing this shirt." One Minneapolis retailer did reach out to @G33KDad after he shared his concerns, saying they never intended to leave anyone out, and they will share his thoughts with 'the right team'. Princess Leia hasn't been completely left out of the Mens and Boys clothing isle at Target. A Target site search returned 138 hits for 'Star Wars shirt', and the Princess does appear on several T-shirts for men, and at least 1 T-shirt for women. She was discovered in cartoon form on one boys T-shirt, though it is Halloween specific. She can also be found hiding in the upper corner of a boys graphic T-shirt that prominently features Darth Vader and Luke Skywalker. Is this an instance of fans being too overly protective of their franchise? Is it truly sexist? The camps seem to be split down the middle. There are those who are angry that the manufacture manipulated and changed the photo from its original scene. Then there are those who hate that Princess Leia was shoved off the front of a boys shirt just to help sales. Which, if that's the case, hasn't been proven. On a side note, there are quite a few other Star Wars T-shirts that manipulate and change certain scenes for humorous effect. So should it matter who or what appears on a Star Wars novelty shirt? What do you think about this matter? Here's a good look at the shirt in question. You can order it Here. Who knows, it might be pulled and turned into a collector's item. And it's only $4.50 right now!